Google and other search engines do, in fact, use inbound links to your site as a clue to determine how relevant your site is compared to others in your industry. It`s like a high school popularity contest. If 500 people point to one particular person (let`s call her “Amy”) to say she is the most popular person, while only two people point to “Susan,” a social network analysis would indicate that Amy is more popular than Susan. Links work the same way. If you have a website, the last thing you want to do is send people away to another site with a link. That`s why links are important. It means that the content that you want to link to matters enough to you that you`re willing to share your visitors with another site. Strong links, from important domains matter a lot more than spammy links from non-ranked domains. In the world of SEO, Domain Authority is what matters. Only a handful of sites have a Domain Authority of 100 (the best). Very few, like CNN.com, NYTimes.com are in the high 90s. An inbound link from a site like CNN is worth literally hundreds of links from sites that have a lower domain authority. But inbound links from really spammy sites (ones that don`t even have a Domain Authority) can actually hurt your site. 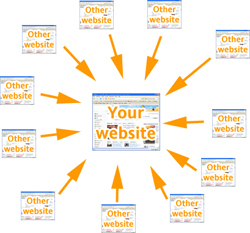 Sites that exist only to create links to other sites are generally known as link farms. SEO scammers will often add some additional spammy links to your website, so that they can keep the scheme going. Having suspect outbound links on your site can harm your site, too. Let me know if you`d like us to analyze your inbound link profile (free of charge).